Mission: To protect the citizens of the state through the licensing of physicians and other health designated professionals, assessing their competence to practice and their moral character. It is also the Board's duty to investigate all complaints against its licensees in a fair and equitable manner. 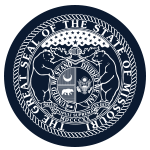 Function: The Missouri State Board of Registration for the Healing Arts registers, licenses, and regulates all physicians and surgeons in the state. In addition, the board is also responsible for all physical therapists, speech pathologists, audiologists, physician assistants, clinical perfusionists, physical therapist assistants, anesthesiologist assistants, and athletic trainers. The members are supported by a staff of 44 administrators, investigators, licensure technicians, and clerical staff to handle daily operations. Members review and act on issues of discipline, licensure, rules and regulations, legislation and other business. The board has the power to revoke, suspend, deny, probate and reinstate licenses. Location of meetings: Jefferson City; occasionally Kansas City and St. Louis.